Zhu Guangqian and Benedetto Croce on Aesthetic Thought, with a translation of Wenyi xinlixue 文藝心理學 (The Psychology of Art and Literature). Leiden. Brill, 2019. 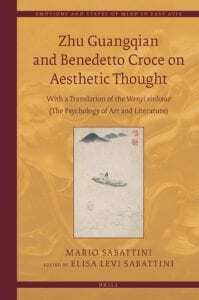 In Zhu Guangqian and Benedetto Croce on Aesthetic Thought, Mario Sabattini analyses Croce’s influence on the aesthetic thought of Zhu Guangqian. Zhu Guangqian is one of the most representative figures of contemporary Chinese aesthetics. Since the ’30s, he had an active role in China both on the literary and philosophical scenes, and, through his writings, he exerted an important influence in the moulding of numerous generations of intellectuals. Some of his works have been widely read, and they still provoke considerable interest in China, on the mainland as well as in Taiwan and Hong Kong. The volume also presents a revised translation of Zhu Guangqian’s Wenyi xinlixue (Psychology of Art and Literature).